After the sixth egg, I just knew I had to finally get a real Italian to teach me how to knead pasta dough properly. I had wasted enough flour and eggs trying to make my own while following written instructions and videos online. For one reason or another, I just couldn’t get the dough to roll into one; it kept breaking into shard-like pieces. I had no idea how it should feel under the bottom of my palms and had no basis of comparison since I’ve never made my own pasta before. I’ve been trying to get in the recreational pasta class at the Institute of Culinary Education, but every time I checked their calendar, the class would be full. They never sent out any emails to announce when new classes opened up so I couldn’t even try to sign up earlier. Another search for pasta-making classes in New York City revealed Rustico Cooking in the midtown area. I signed up and spent half an afternoon in an open-loft kitchen with a few couples and, thankfully, some who came on their own. It turned out to be a very productive afternoon and a great–and more affordable–alternative to ICE or the French Culinary Institute. During our three-hour class, we watched and followed founder and chef Micol’s instructions on how to make gnocchi, cavatelli and tagliatelle. 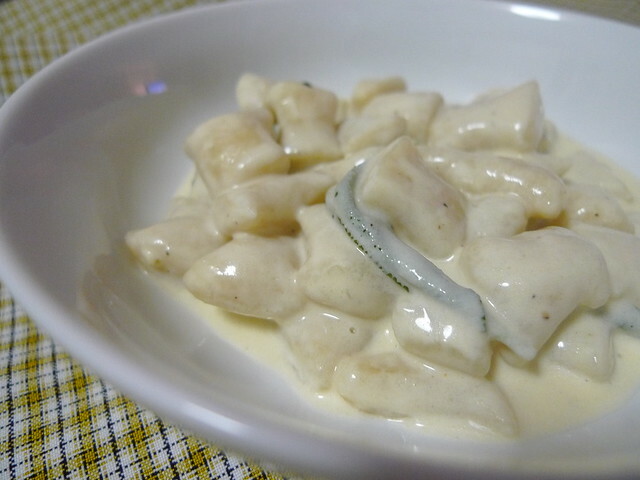 I felt the mashed potato and the flour in my hands when making the gnocchi: I kneaded, rolled and cut the dough. I left the class feeling like I could do the three recipes on my own. This is my first attempt in trying to replicate the gnocchi-making technique I’ve learned in class. I bought my own potato ricer and dough cutter for this recipe. I didn’t really want to buy any more toys for my kitchen, but the potato ricer is one of the most amazing gadgets I’ve ever come across: mashing potato will never be the same. I think the dish turned out well even with my made-up sage cream sauce. Admittedly, my gnocchi wasn’t as light and fluffy as Micol’s, and I’m not sure if it’s because I used yellow potatoes instead of the recommended Yukon gold, or if I didn’t get the precise cup and a half measurement for the flour. But I can at least say that I’ve done it myself–there’s really no going anywhere from here except better pasta. 1. Make the gnocchi. In a large pot, cover the potatoes with water and let boil under medium fire, until fork tender. Drain, peel and mash onto a clean counter surface using a potato ricer. Mix with flour and knead until smooth. 2. Cut dough into small chunks and roll each chunk into a thin snake-like shape. 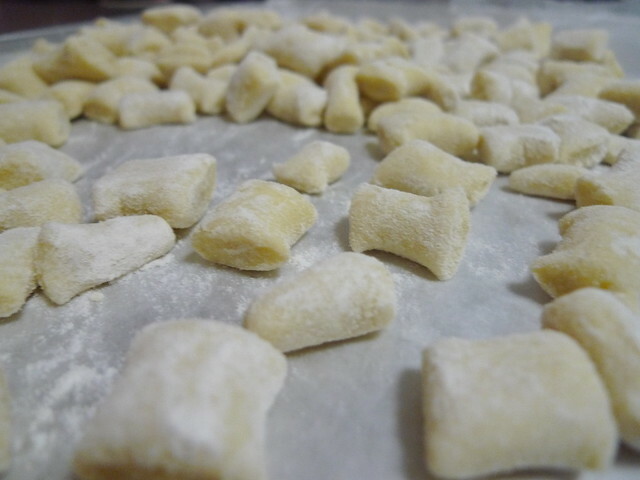 Cut into one-inch pieces to make gnocchi. Gather all gnocchi on a lined bake sheet and sprinkle with flour to avoid sticking. 3. Make the sage cream sauce. In a heavy skillet, melt the butter. Add the sage leaves and fry. When leaves are lightly browned, add the cream and the cheese with some pepper. Stir continuously with a whisk until well combined. 4. In the meantime, cook the gnocchi. Put a pot of water to boil with some salt. Add the gnocchi and wait for them to float to the surface. Scoop the gnocchi using a slotted spoon and transfer to a sieve and then to a plate. Pour enough cream just to slightly cover the gnocchi. Great recipe! Love the pictures. Makes me want to cook this recipe tonight :) Thanks for sharing. Used your gnocchi recipe the other night and topped it with some red sauce we made and froze with the last of the summer’s tomatoes. Your recipe is simple and effective. Nice that the ratio of potatoes to flour is 1 lb. :1 cup. Easy to remember.